In May 1995 to commemorate the 125th birth anniversary of Mahatma Gandhi, Abhinaya presented ‘Gandhi-the Mahatma’. In this show, Mythili Kumar presented a brief solo work based upon Cesar Chavez’s farmworker strikes which had been inspired by Gandhi’s non-violent civil resistance movement. 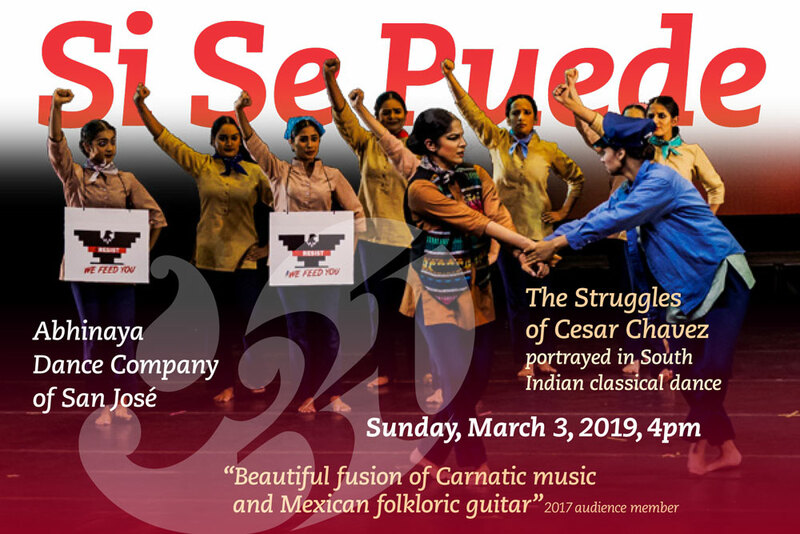 Building upon this work, the company presents Si Se Puede, vivid portrayals of Cesar Chavez’s life, his struggles as a hardworking farmworker, his awareness of Gandhi’s non-violent principles and his leadership through forming the United Farmworkers union fighting for the rights of the farmworkers. Carnatic musicians and Mexican folkloric guitarists accompany this inspiring performance. 2019 Events I Have A Dream!